We are pleased to announce our paper describing the new GPU performance enhancements to gprMax has been published in the journal of Computer Physics Communications. We designed optimal kernels for GPU execution using NVIDIA's Compute-Unified Device Architecture (CUDA). 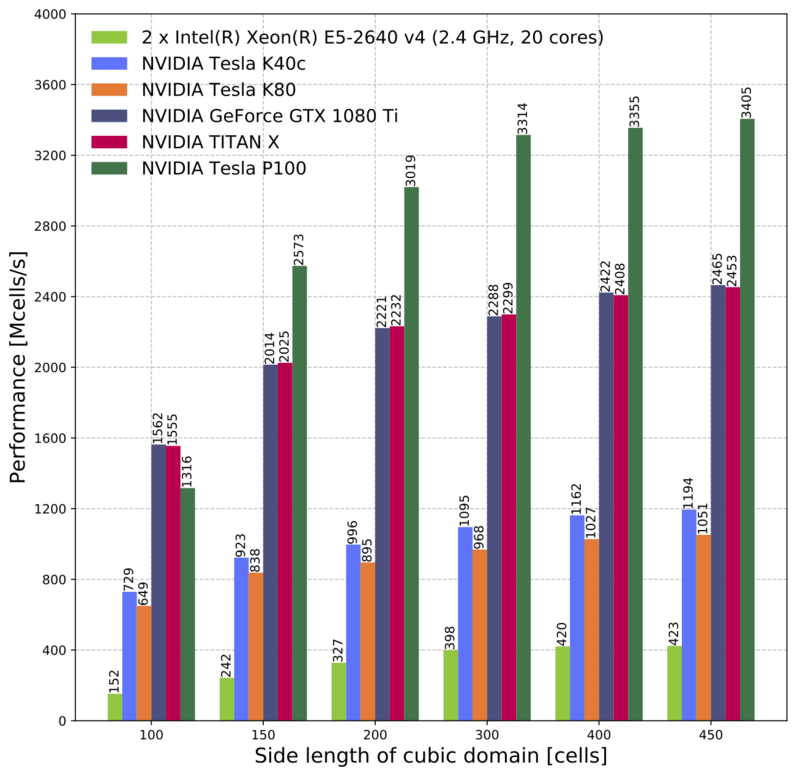 We tested our GPU-based solver on a range of Kepler and Pascal NVIDIA GPUs. It achieved performance benefits up to 30 times faster than the parallelised (OpenMP) CPU solver can achieve on a commonly-used desktop CPU (Intel Core i7-4790K), and significantly faster than a server CPU (Intel Xeon E5-2640). We carried out this work as part of a project with Google Fiber (USA), and had support from NVIDIA (UK). The paper is open-access and we would appreciate that if you use gprMax and publish your work, you would cite this new paper. 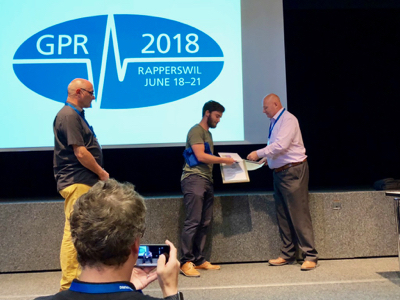 The Young Scientist Best Paper Award at the 17th International Conference on Ground Penetrating Radar (GPR2018) was won by Sam Stadler from the Leibniz Institute for Applied Geophysics, Hannover, Germany. This is the second time in a row that this prize has been won by a researcher using gprMax, after Markus Loewer won the award at GPR2016. Sam developed a detailed and realistic antenna model similar to the Geophysical Survey Systems, Inc (GSSI) 400MHz antenna. He has used the model as a key component in simulations to investigate using guided GPR waves along metallic cylinders in boreholes for permittivity sounding. You will be able to read Sam's paper when the conference proceedings are published by the IEEE. Well done Sam! We are excited to announce the release of version 3.1. Code-named Big Smoke, it continues our whisky-based naming, and is also a reference to the cities of Edinburgh (Scotland) and San Francisco (USA). Why? Because the development of v.3.1 was funded, through a research project, by Google. We are making this release available to coincide with the 9th International Workshop on Advanced Ground Penetrating Radar (IWAGPR2017) which we are hosting next week, 28-30 June. We look forward to discussing the release with participants at our pre-conference workshop, and delegates at the conference. The most significant feature of this release is the ability for simulations to utilise general-purpose computing using graphics processing units (GPGPU). We have used NVIDIA's Compute-Unified Device Architecture (CUDA). Our testing on both consumer and data centre NVIDIA GPU cards has shown dramatic performance increases over our parallelised CPU (OpenMP) implementation. For example, in the figure shown, a model with 400x400x400 = 64 Mcells could run up to 20 times faster on a NVIDIA TITAN X GPU than on 4 cores of a Intel® Core™ i7-4790K CPU. These types of speed improvement open up a lot of new opportunities and possibilites for FDTD simulations, not just for GPR! You can read about how to use the GPU functionality and find full documentation in our User Guide. Please report any bugs with the code via the Issues feature on our GitHub page. For help and general advice on using the software visit our Google Group forum. We are pleased to announce that our paper describing the new version of gprMax has been published in the journal of Computer Physics Communications. Some of the new advanced features of the software explained in the paper are: dispersive material simulation using multi-pole Debye, Drude or Lorenz expressions; realistic soil modelling; rough surface generation; and the ability to embed complex transducers and targets. Have a look/listen to the audioslides (~5mins) which briefly explain GPR and gprMax and describe the key features of the paper. The 9th International Workshop on Advanced Ground Penetrating Radar (IWAGPR 2017) is being hosted by the School of Engineering at the University of Edinburgh. We have therefore decided to design what we believe to be a realistic 3D GPR model which we think offers a challenge for testing GPR processing, imaging, and inversion algorithms. Before releasing information on the detailed construction and composition of this model (to be used by the GPR research community) we would like to offer the modelled data as an imaging and interpretation challenge to GPR researchers. We have scheduled a session in the IWAGPR2017 conference programme, in which we hope some results can be presented. The dataset and a full set of instructions can be found at our GitHub repository. The latest in our series of showcased projects is by Markus Loewer from the Leibniz Institute for Applied Geophysics in Germany. Markus was the GPR2016 Young Scientist winner, and is using the new dispersive material modelling capabilities to create multi-pole Debye models to accurately simulate the frequency-dependent dielectric properties of different soils. Read more about it in the projects section. We have added some screencasts and videos to our YouTube channel. There are screencasts to help new users with installing and updating gprMax. We have also created videos, like the one shown here, that demonstrate how electromagnetic fields propagate in different environments. These are fairly simple 2D models but, nevertheless, are educational and provide some useful insight. We will be adding videos of more complex simulations as well as screencasts of guided example models. You can find a list of all the screencasts & videos in the User Guide.